How to convert DVD to MPEG with Xilisoft DVD to Video? 1. What Xilisoft DVD to Video can do for you? Convert DVD to MPEG, WMV, DivX, MP4, H.264/AVC, etc. Now you can freely enjoy classic DVD movies on various portable devices like iPod, iPhone, iPhone 3G S, once own the powerful DVD Converter software. Follow the 1-2-3 steps, you will find the conversion from converting DVD movie to mp4 is so easy and fast. Step 2. After loading the DVD movie, you can convert DVD with three main modes. One is title mode (converting the whole DVD to one file), one is segment mode (converting video clips), the other is chapter mode. Step 3. 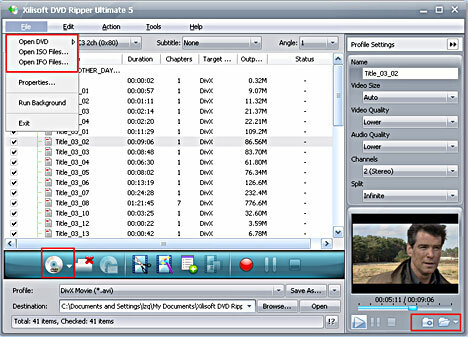 Choose "MPEG" video format from the video format list, and click the red button to start the DVD to MPEG conversion. PS: If you have interested in editing the video, enjoy the pleasure from it with Xilisoft DVD to Video. How to make Multi-track MKV video? How to convert DVD to FLV with Xilisoft DVD to Video?